The amount of trash cluttering Market Street in San Francisco may soon dwindle. That's because the city by bay is installing 38 new trash receptacles along the typically dirty stretch of pavement. San Francisco's Public Works Department on Tuesday announced the garbage can additions as part of its "Yes We Can!" pilot program designed to reduce waste around the city. 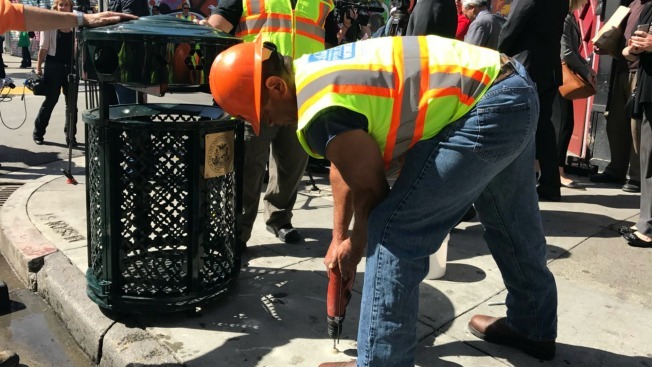 The 38 new bins bring the number of trash receptacles along Mission Street between 14th and Cesar Chavez Streets to 73. City leaders admitted that increasing the amount of trash cans may not actually help tidy up city streets. Roughly one decade ago, San Francisco actually extracted about 1,000 public receptacles. That's because people rummaging through bins tended to scatter trash on nearby sidewalks and others illegally placed their personal trash next to public bins instead of paying for service. "Our aim with Yes We Can! is to find the sweet spot that provides more places for people to dispose of their trash properly, while not adding to the litter problem with people using the cans inappropriately," Larry Stringer, operations chief for San Francisco Public Works, said in a statement. City leaders will install additional trash cans in other neighborhoods if the pilot program along Mission Street proves to be successful.